We bring forth the best-in-class Graphite Crucibles which are used for installation in wide range of purposes. These furnaces are made of best materials which are supplied by one of the top vendors. Our products are highly durable and also corrosion resistance. Moreover ,the products are manufactured by skilled workers so that they have a perfect finish to ensure stability and dimensional accuracy. 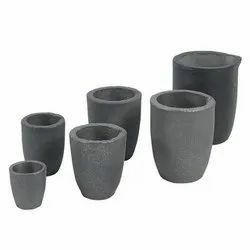 We provide a huge assortment of Graphite Crucibles for our esteemed clients. They are made from quality-approved materials to ensure the satisfaction of our valued clients. We offer these products in various designs, shapes and sizes, keeping in view the requirements of our clients. Furthermore, they are light weight, high breaking point, extremely durable and accomplished in international standards sizes as well as in customized range with on time deliveries.